Special events are usually all-day events during which people gather to re-create the Middle Ages with as much authenticity as possible, given modern safety and other considerations. Activities vary from event to event but most have a tournament and an elaborate evening meal called a feast. There may also be a royal court, games, arts competitions, dancing, and bardic circles (storytelling, music and poetry). 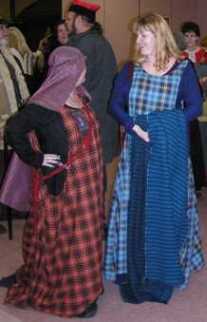 An attempt at pre-1600s costume is required to attend. Local branches usually host one or two special events per year. Vest Yorvik hosted "Step Sprightly", a dance event in February 2013. For a list of upcoming events in the Kingdom of Ealdormere (Ontario), please see the current events calendar on the Ealdormere home page. Weekly meeting topics range from lectures to special event planning; in addition there may be fight practices and archery practices. Details and locations are as listed in the Schedule. Modern clothing is appropriate. On an irregular basis we do demonstrations of what we are about and the sorts of things we do. Details and locations are as listed in the Schedule. Canton members are encouraged to list their arts or science activities in a database called the Orange Book. For the user ID and password to access the online Orange Book, contact the Minister of Arts and Sciences or the Web Minister (see Contacts). Alternatively the MoAS has a paper version available at Canton meetings. This is the recognized web site for the Canton of Vest Yorvik of the Society for Creative Anachronism, Inc. and is maintained by Webminister Heather of Dormanswell. This site may contain electronic versions of the group's governing documents. Any discrepancies between the electronic version of any information on this site and the printed version that is available from the originating office will be decided in favor of the printed version. For information on using photographs, articles, or artwork from this web site, please contact the Webminister. She will assist you in contacting the original creator of the piece. Please respect the legal rights of our contributors. Copyright © 2007 The Canton of Vest Yorvik; celtic knotwork copyright Aon Celtic Art. The original contributors retain the copyright of certain portions of this site.